The NCP5210 3-In-1 PWM Dual Buck and Linear DDR Power Controller, is a complete power solution for MCH and DDR memory. This IC combines the efficiency of PWM Controllers for the VDDQ supply and the MCH core supply voltage with the simplicity of linear Regulator for the VTT termination voltage. This IC contains two synchronous PWM buck controller for driving four external N-Ch FET's to form the DDR memory supply voltage (VDDQ) and the MCH Regulator The DDR memory termination Regulator (VTT) is designed to track at the half of the reference voltage with sourcing and sinking current. 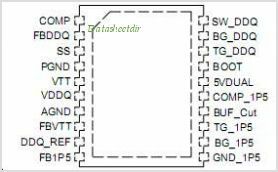 This is one package pinout of NCP5210,If you need more pinouts please download NCP5210's pdf datasheet. 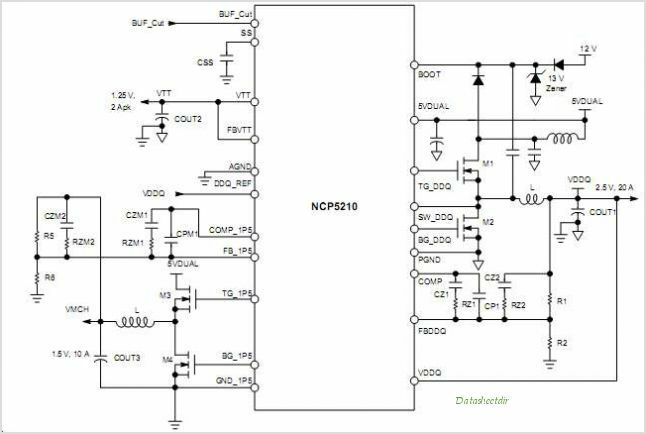 This is one application circuit of NCP5210,If you need more circuits,please download NCP5210's pdf datasheet.